Back in November I reviewed Lincoln during its theatrical run, and my feelings on the film haven’t changed much. There are some incredible moments and wonderful performances, but its still minor Spielberg. It’s interesting to note that Jurassic Park also hit BluRay this week, and between these two films the versatility Spielberg has on display is incredible. The man truly is one of film’s greatest directors, and the bonus features on the Lincoln BluRay has no problem with highlighting this fact. This is the kind of expansive disc that wannabe film makers shouldn’t hesitate to pick up. The behind the scenes features are exhaustive, charting everything from the conception of the film to production to post-production tweaks. The amount of artistry that went into Lincoln and the attention to period and character detail is fully divulged, and it is mind numbing. The disc dedicates equal time to the various departments, from production design to costumes to lighting to make up, and the various artisans spent just as much time researching the period and characters as the writer, director, and actors did. This is the kind of set that makes me wish I liked the actual movie more. The packaging is classy and smart, the extras shine real light on how the film was made that avoids the standard talking head/glowing comments that every one says in the moment when they’re on any other project. Spielberg and Co truly believe in the picture they’re making here, as both an historical document and a political plea for cooler heads to prevail. Lincoln‘s political wheeling and dealing is the the highlight of the film, and above all this film represents a dissatisfaction with how our government constantly gives itself extensions and sequesters itself into ineptitude. I respect this film more than I like it, but I fully love that sharp point made by Lincoln. If you’ve already seen the film and are an immense fan chances are you’ve already picked this set up. But if for some reason you were on the fence, or debating whether or not to spring for the deluxe set, let me assure you: this set is well worth your time and money. And if you haven’t seen the film yet, this is certainly worth the blind buy. 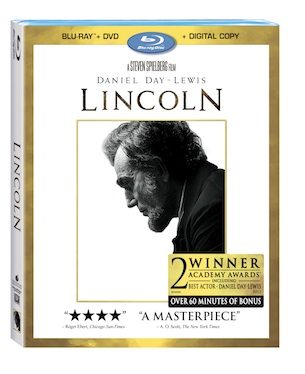 Lincoln is now available on BluRay and DVD. You can order a copy right here. Comments for BluRay Review: “Lincoln” are now closed.